1)What is a "petite" goldendoodle? 2) Is a petite smaller than miniature goldendoodle? "I SAW A MINIATURE GOLDENDOODLE FROM YOU AND THAT IS EXACTLY WHAT I WANT!" 1) A petite goldendoodle is a miniature golden mixed with miniature poodle. 2) Not always. Petite and miniature goldendoodles "can" be comparable in size. However, we are breeding small moms to small dads so we are more likely to achieve that true mini size with our petite goldendoodles than what most people can acheive with a 50/50 mix. We have raised mini goldendoodles in the past and have also been successful at achieving miniature sized goldendoodles from our f1-b matings. However, we no longer do the f1-b matings as we are no longer set up for that. 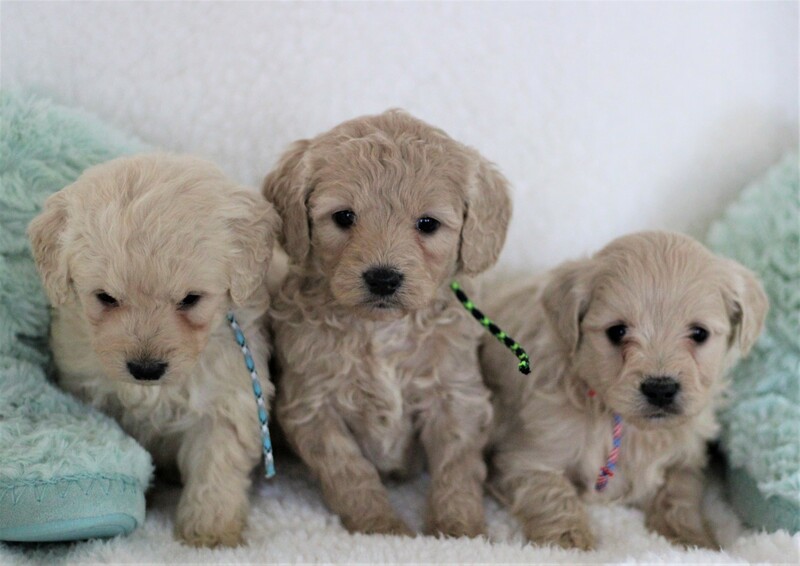 We currently only raise the petite goldendoodles because we have found that temperaments are the same with the petite goldendoodles and the miniature goldendoodles but it is much easier to produce the petite goldendoodles in our situation. A miniature goldendoodle (1st generation) uses a standard golden female (typically) and a miniature or toy poodle male. There are other variations of miniature golden doodles such as F1- b which is typically 75% mini poodle. Those are typically truly mini in size. IF YOU SAW A PUPPY BRED BY US THAT IS UNDER 30 LBS, IT IS LIKELY A PETITE GOLDENDOODLE. We are a breeder, located about an hour north of Billings, MT. ALL of our puppies are born inside. The puppies will have their first parvo shot and de-wormings.